If you aren’t done planning your holiday dinner yet, consider adding this salad! It is sweet, tangy, savory, hearty and totally delicious. You may find yourself going for seconds! The blueberries, and pomegranate balance out the tart dried cranberries and a fresh lemony dressing. A great salad starts with crispy fresh greens. In this salad we use a head of red leaf lettuce. I find whole head lettuce so much crispier and fresh compared to boring old spring mix. I used to use spring mix all the time and have noticed that I like salads so much more when they are prepared with fresh romaine, red leaf, or butter lettuce. The feature of this salad is the maple roasted brussels and let me warn ya, you are going to be making these as a side on the regular after you taste them! My son eats them like potato chips! The seasoning includes lemon juice, maple syrup, cumin, paprika, garlic powder, paprika and black better. I will admit…it can be time consuming to remove all the pomegranate arils (or seeds) from the pomegranate. You have a couple options here; you can buy them already de-seeded, do it yourself, or you can ask your significant other to help you out! This is one of the few things I ask my hubby to help with and he actually doesn’t mind a bit. He is really good at it and to be honest, it kinda frustrates me, so it works out! I hope you enjoy this salad as much as my taste testers and I do! Serves 10-12+ as a side dish. Cook time 30 mins. Prep time 30 mins. Total time 30 mins. Brussels sprout marinade, 1 Tbsp maple syrup, 2 tsp lemon juice, 1 tsp avocado oil, 1/4 tsp paprika, 1/4 tsp cumin, 1/4 tsp garlic powder, 1/4 tsp sea salt, 1/4 tsp black pepper. Combine the brussels sprout marinade ingredients and whisk together with a fork or small whisk. Remove the ends from the brussels sprouts and cut them in half. Pour the marinade over the brussels sprouts and stir. Add to baking sheet and bake for 30 mins. If you need to save time, skip the marinade and just add a little oil, maple syrup, and sprinkle with spices. Meanwhile wash and dry the lettuce and kale. Chop the lettuce to your liking. Remove the stem or main vein from the kale leaves and tear the leaves into small bite size pieces. Place in a large salad bowl. Combine the dressing ingredients in a blender and blend thoroughly for about one minute. Pour into a jar or salad dressing container. 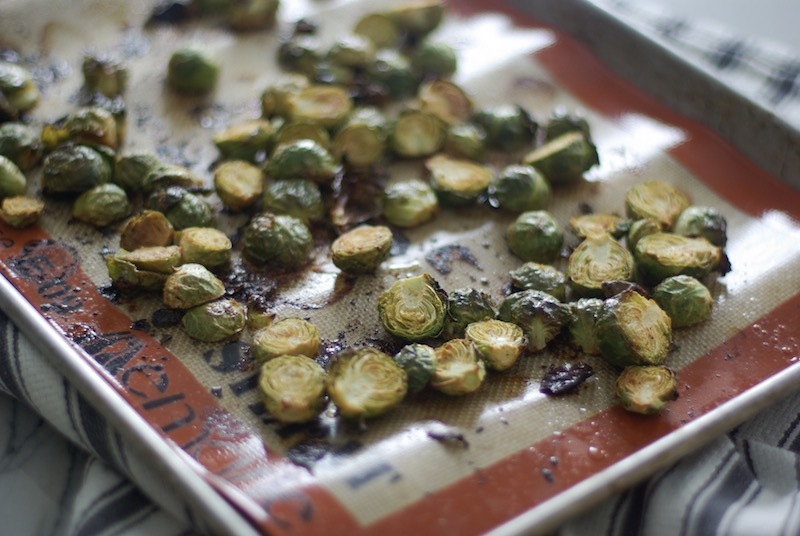 When the brussels sprouts are slightly browned and crispy, remove from oven. Add the blueberries, cucumber, pecans, pomegranate, and brussels sprouts to the salad. Serve with the salad dressing on the side or mix some of the dressing in with the salad shortly before serving. This salad will keep for several days in the fridge (as long as there is not dressing on the salad), so you could make this in advance of a holiday party or get together. If making in advance, I would recommend making it the day before to ensure maximum freshness of your ingredients. Recipe Notes: You can prep the brussels sprouts in advance and store them in the fridge until you are ready to make the salad. You could also make the dressing in advance. Try to find cranberries sweetened with apple juice versus sugar. I have seen them both online and in health food stores.